A multi-dimensional public health crisis is unfolding on the U.S.-Mexico border that few seem ready to acknowledge, anthropologists Rachel Stonecipher & Sarah Willen write on the Access Denied blog. The complexity of this crisis came to light during a recent study tour to Tucson, Arizona, in which Rachel Stonecipher took part. Dehydration and heat-related illness claim hundreds of lives annually, and many of these deaths go unrecorded. No uniform system exists to count or repatriate remains. “We can only imagine the impact of these missed opportunities for identification on family members searching for their loved ones”, Stonecipher and Willen write. Detainees are also at risk of abuse – physical and mental – at the hands of police and Border Patrol officers. 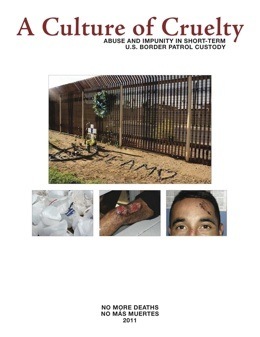 Despite official denials, No More Deaths, the Border Action Network, and other NGOs have collected and responded to numerous reports of abuse. Like the humanitarian organizations that work along the border, we all must insist on an expansive understanding of “public health” that recognizes people in transit as members of a common moral community: as people who are connected to us, and whose lives matter. Whether or not we understand or agree with the choice to migrate, activists along the U.S.-Mexico border remind us that border crossers are human beings who – like all other members of our moral community – are deserving of health-related attention, investment, and care. The notion that there is democracy in the West, while there is none in the “rest” might be one of the most powerful and dangerous myths of our time. In reality, democracy is a contested concept everywhere in the world, not only in Egypt or Tunesia, but also in Britain. – What I think is happening is that people from Egypt, Tunesia, Russia, Greece, UK and many other countries are discovering that they are natural allies, engaged in a common purpose. – We’re not in the middle of a revolution, but we might be in the midth of an important phase where revolutionary development on a global scale is taking place and the limits of the global neoliberal capitalism are being brought to light. – I don’t call it rioting. I call it an insurrection of the masses of the people. It is happening in Syria, it is happening in Clapham, it’s happening in Liverpool, it’s happening in Port-au-Spain, Trinidad, and that is the nature of the historical moment. This is a solid, deep form of alienation built up not overnight, or over the last two years in response to cuts (shame on you Ken Livingstone) but one which is built into the fabric of the broad political settlement of the last decades and reflected in the city’s divisions between rich and poor, between black, brown and white, between young and old. The riots rest on a conviction not just that the barriers are there, but that they are solid walls, through which none will pass. The reactions to them as ‘mindless violence’ simply confirm this fact. It is not that people are rioting because they don’t have jobs, but because they must believe, ultimately, gloomily, grimly, that there is nothing for them in their future. 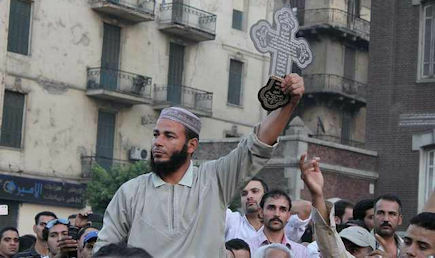 While the mass protests in Egypt and the rioting in England cannot be equated ("Egyptians and Tunisians took revenge for Khaled Said and Bouazizi by peacefully toppling their murdering regimes, not stealing DVD players.“not by stealing DVDs”, Mosa’ab Elshamy comments), the contexts in which they occurred are similar: growing inequalities due to neoliberal policies and an inceasingly oppressive state that does not care for its citizens. What we see is the global civil society rising up against what is clearly exposed as the alliance of the corporate sector (…) and Western governments (…). The message is clear: dissent will not be tolerated as the whole anti-terror apparatus is used not against terrorists but against cyber-dissenters and protesters. As reaction to the riots, Cameron considers – in similar way as his friend Mubarak (source) earlier this year - to shut down social network sites like Facebook and Twitter and sms services as well for “those suspected of planning criminal acts”. Suddenly, criminals would become legitimate protestors fighting against an oppressive state who have turned democracy into a puppet show. Mindlessness would create randomness, but the events unfolding are far from being random. Instead, I would argue that what we are witnessing is a significant symbolic statement about the way power – the power of life and death exercised by police officers as well as the power to consume – is arranged in British society. The riots are said to have started with a protest against the controversial killing of Mark Duggan by the English police during an anti-gun crime operation. Yet no commentator links the incredible number of riots in different cities to that particular incident, notes anthropologist Gabriel Marranci. And when somebody, as Darcus Howe in the mentioned BBC interview is trying to address this issue, he is cut off and silenced. “We cannot talk about this now. We don’t know what has happened. We have to wait for the police inquiry", the BBC news anchor said. On Saturday, hundreds of people gathered outside the Tottenham police station, peacefully calling for “justice” for Mark Duggan, a man killed by officers three days prior. Police stood in formation, separating the community members from the station they were guarding, until a 16-year-old woman reportedly approached an officer to find out what was going on. According to a witness account, some officers pushed the young woman and drew their batons. “And that’s when the people started to retaliate. 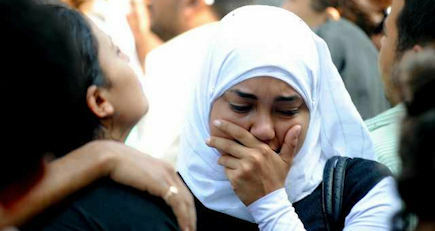 Now I think in all circumstances, having seen that, most people retaliate,” said the witness. “When the rioters themselves are asked, they will say that they are abused by police, harassed by them, and nobody’s done a thing about it”, says Richard Seymour PhD candidate at the London School of Economics to Al Jazeera. There have been 333 deaths in police custody between 1998 and 2010 in Britain. Large, peaceful protests in response to these killings were more or less ignored, he said. Not a single officer has been prosecuted. As a result, Duggan’s killing crossed a threshold for young people, angry with the systems that have left them behind, and tired of non-violent protest that goes without much response. Class and classism are under-researched topics in mainstream anthropology.